What people feel in their hearts has profound influence over their motivation & workplace performance. Don’t let the title throw you. This is a very serious book – based on compelling new research – that proves the solution to our global engagement crisis lies in the last place traditional business wisdom would suggest we’d find it. 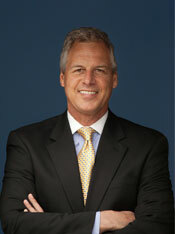 During my financial career, I had extraordinary success in managing people at all job levels. Teams I led routinely excelled, and then some. So when I set out to write my book, I was determined to better understand why my uncommon approach to management was so successful. More to the point, why did my leadership practices influence people to be so consistently loyal, engaged, committed and productive? Two years of research later, I published “Lead From The Heart”. It begins with my own personal story — an especially painful upbringing that influenced me to lead people very differently compared to my peers — and is filled with remarkable new research that makes this irrefutable business case: Employee engagement will never improve unless we reinvent leadership for the 21st Century. To some people, their instinctive response to my book’s title is that it sounds like soft management. That’s because we’ve all been conditioned to believe that bringing the heart into business is a “touchy-feely,” and “weak” approach to leading people. But in the rough and tumble world of financial services, I managed bankers, stockbrokers, loan agents and so many other job families — all with remarkable success. And not only did I prove that leading this way isn’t weak, I proved it’s actually the holy grail when it comes to motivating human beings to excel in their jobs. So make no mistake, this book is all about achieving sustainable business results, driving uncommon commitment and keeping your high achievers working for you and driving your company’s profitability. We all want to crush our numbers, and I’m no different. After all, our human brains carry thousands of years of focus on survival and competition. But during my research, I realized that we’ve also seen centuries of amazing evidence of what the heart can do in sports, art and music. And I’m convinced business is next. I saw it proved out over and over again…when I led from my heart, my people enthusiastically followed. And so will yours. Lead From The Heart is now being taught at eight American Universities including the Graduate strategic leadership seminar at the University of Iowa and the Organizational Psychology Ph.D. program at Brandman University, a member of the Chapman University system. Lead From The Heart was also named one of the “10 Best Strategy Books To Beat The Competition” by the book editors at Small Business Trends. 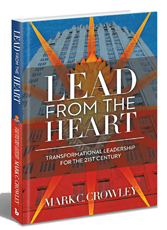 Lead From The Heart is also an Amazon.com Top 100 Bestseller in the Business/Workplace Culture Category. Copyright © Mark C. Crowley. All Rights Reserved.